But as recent headlines make clear, we still haven’t managed to outrun some of our Cold War-era habits. There is an I-told-you-so kind of glee in U.S. reporting of the Russian protests over mishandling of the elections, the same glee that’s reflected in coverage of the “Occupy” movement by Russian news outlets. “Mass arrests in the United States” a nightly news report on Channel 1 bleated. Thirty-one protestors had been taken into custody in Washington D.C. — hardly a revolution, but such is the distorted glimpse we tend to get of one another’s politics. 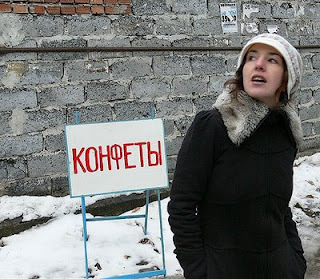 That first time in Russia, I couldn’t figure people out. They had a strange air of contradiction in their essence. Architecture was torn between modernism and an attachment to classical forms, Greek-style columns painted over with awful pastel greens or yellows that were now flaking off. The youth were torn between making jokes at the expense of Americans and between a strong desire to imitate American culture. Life was torn between glamorous fashion magazines and crumbling Khrushchev-era apartments. I first heard about Alina from this silly article in The New York Times Style Magazine about a new wave of Russian literati and media makers. Can I have in, please?